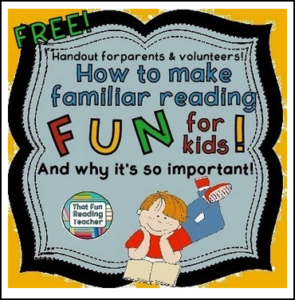 Reading Handout: Free Reading Handout for parents and volunteers! How to make familiar reading fun for kids – strategies for parents and volunteers! Reading information for parents and reading volunteers. Ideal for Meet the Teacher / Curriculum Night presentations! This handout contains information for Parents and Volunteers – a tips and tricks reference sheet for Familiar Reading; based on experiences guiding parents and volunteers from the years I taught Reading Recovery. Color and black and white copies provided. If you double-side copy, you can hand out just one piece of paper per person at Volunteer trainings, Meet the Teacher or Curriculum Night, or place this information in students’ reading folders. I hope you find this as useful and time-saving as I have over the years! Thank you in advance, to those of you who purchase this item and generously take the time to leave feedback. ★Reading Log – Rejigged! Sample FREE! ★The Complete Personal Printable Alphabet Book Kit with over 200 Line Art Images! ★Write for Real Purposes: Hospital Dramatic Play Center with Printables!